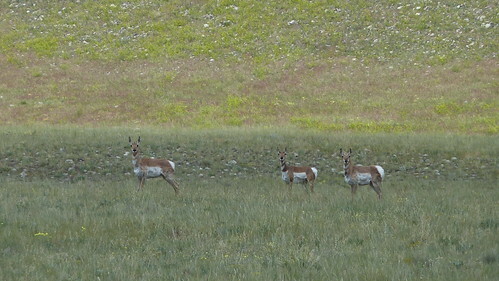 Cycling into West Yellowstone I was still elated by the early morning wildlife show I had just witnessed (see previous blog post) and was happy to be joined for breakfast by Joe, former US Navy and one of the ACA (Adventure Cycling Association) Trans Am riders. He told me they had arrived in West Yellowstone via a different route from Jackson WY and had been caught in a nasty marble sized hail storm the previous day. Whilst in town I bumped into a guy outside the bike shop who was complaining that he was waiting for the shop to open to get his forks sorted out. 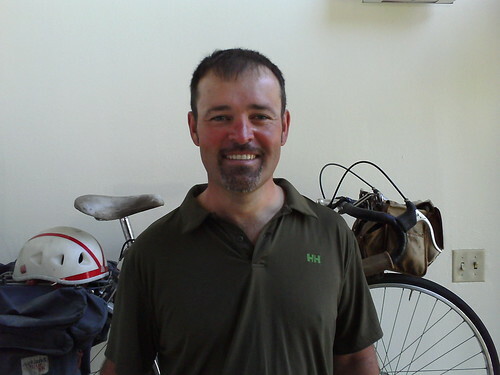 In his late 40’s, the guy had a white goatee beard and a Campagnolo chainset tattooed on his shoulder. I was to have a few strange encounters with this rather obnoxious character over the coming days! After catching up on emails, Twitter, Facebook and Skyping home, time was moving on and I was only part way in to a huge 90 mile day. 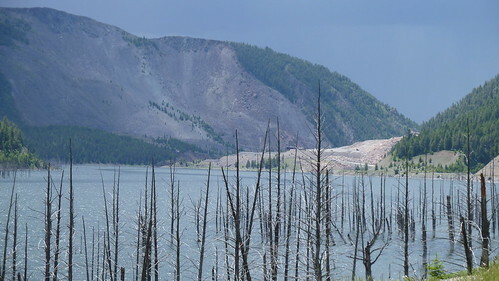 I was soon pedalling alongside the gorgeous Hebgen Lake and through the aftermath of the 1959 earthquake that created a landslide dam on the Madison river, creating Quake Lake and killing 28 people in the process. 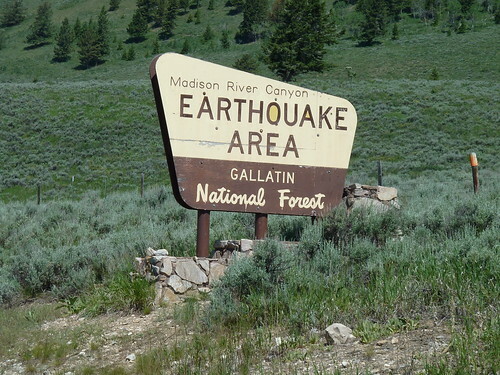 Still one of the largest earthquakes to hit the USA in recorded history. 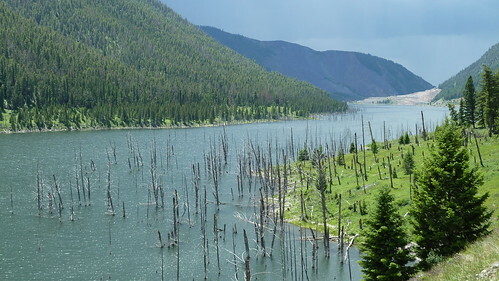 The lakes are fed by the Madison river which I had been following since day break and lie in the Gallatin National Forest. Seeing the sky turning ominously black in the mountains up ahead, I decided a lunch stop might be in order. I spotted a sign advertising home cooked lunches and I headed down a track to a cafe by the river and was soon tucking into a large burger and fries and chatting away to various tourists and fishermen on neighbouring tables. As I got up to leave the strange guy from West Yellowstone with the tattoos appeared and preceded to talk at me about his frame flex problem on his bike and how he was heading wherever the road took him and didn’t need to follow any routes or maps! This guy had obviously been out in the sun for far too long and thought he was the guru of cycle touring, I was soon to find out he wasn’t! 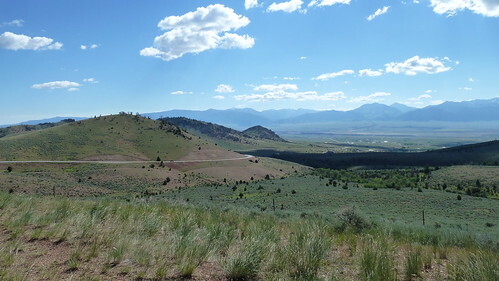 I dropped down out of the mountains that formed the Beaver Head National Forest, out in front of me the wide plain of the Madison river valley slopped away into the distance. The dark skies weren’t abating and a storm front was chasing me, but the winds for a change were in my favour, so I tucked down behind the handle bars and let mother nature do the work! Distance slipped away and before the storm blew itself out I had covered an effortless 30 miles towards Ennis MO. 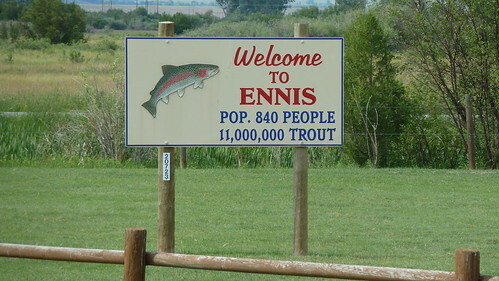 On arrival in Ennis I was greeted by the town sign stating Population 840 People and 11,000,000 Trout, this was the self proclaimed fly fishing capital of the USA! 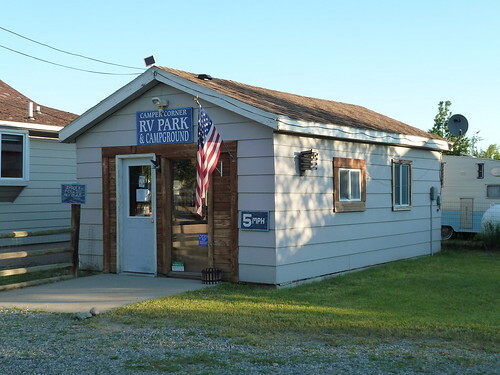 I booked in at the Camper Corner RV Park, a small park with a nice sheltered spot for tents and new owners keen to look after the cycle touring crowd. As an added bonus, a short path from the park led to a great burger and ice cream joint, which it didn’t take me long to patronise and consume my second burger and fries of the day and it was possibly the finest burger of the whole Trans Am! One of the joys of long distance cycle touring is that you can pretty much eat what you want; food is a big focus of your day as it’s your fuel to keep moving. You don’t get a boredom hunger like you get lying around at home, this is a true hunger, when your bodies fuel gauge hits empty and you simply must eat or fall over! I left the UK weighing a muscular! 269 lbs (19 Stone 2lbs), I weighed myself after 4350 miles of pedalling and I was 229 lbs (16 Stone 3lbs). That's 40lbs (2 stone 12 pounds) gone in three months and as a little bonus to you blog readers who may be watching your weight, the following is a genuine days food consumption on Stu’s Trans Am Diet Plan! This is a highly nutritious diet incorporating your 5 a day, well 5 flavours of jelly beans at least! Anyway I digress! Whilst consuming my prize burger and fries the J’s turned up, Jenny, Joey, and Janelle, you may recall them from my last Blog. It didn’t take long after they demolished the last of my fries to get tucked into their own fast food feast. Satiated I headed the short distance back to Camper Corner to deal with the more mundane, such as laundry! 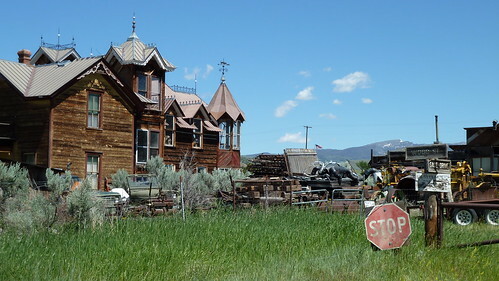 The next morning I was off before the girls, but I was soon grinding away at 5mph up a hellish hill from Ennis to Virginia City. This 12 mile ascent was made all the more intolerable due to the fact you could see the whole damn hill snaking away higher and higher into the distance. Put the same hill in a dense pine forest and it would never feel as bad. Someone should write a book on “Hill Types and their Psychological Impact on Cyclists”, a Booker prize winner guaranteed! Virginia City was a little gem. 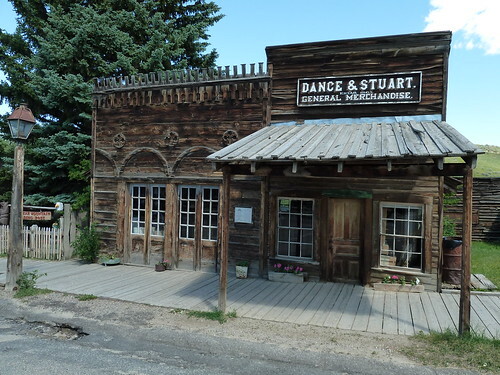 A bit touristy, but this one street, gold rush, cowboy town had many original restored buildings, with places like the grocers containing items from the period. I headed for the old fashioned candy store and found the joys of Salt Water Taffy which I bought copious amounts off. 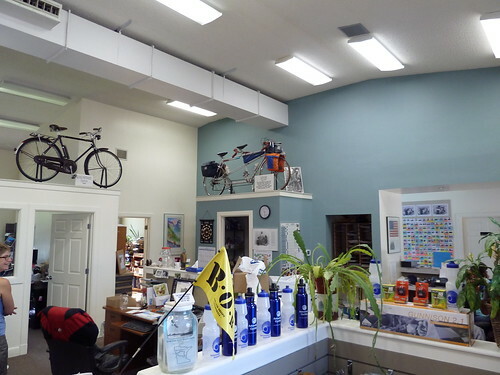 I cycled on through various quaint one street towns and historic landmarks from the areas mining heritage. 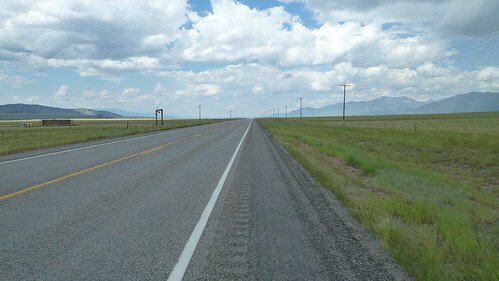 Leaving the small town of Sheridan on route to Twin Bridges I caught sight of a cyclist pedalling along a dusty side road from out on the plains. He turned and pedalled up the road towards me. I quickly realised it was the tattooed Psycho Cyclist, he veered over towards me and stopped. “So you been followin the ACA route like the rest of em?” , “Er yes, it’s been beautiful” I retorted. “Well I found an old ghost town out on the plains, bet that wasn’t on your map”. “Mmmm no”, I replied, he persisted “All you need is a few pages from the road atlas and a chat with the locals and your ready to go” he retorted in his arrogant tone! He started to cycle off and shouted back “Where you heading tonight”, “Twin Bridges” I answered, his brakes squealed on, “Well then use goin in the wrong direction, that’s Twin Bridges”, he pointed towards Sheridan, “Ah no, if you look at my ACA map you will see that the town in the valley is Twin Bridges”. He started to mutter excuses about a farmer giving him wrong directions and disappeared at high speed in the right direction, thanks to my excellent ACA maps! 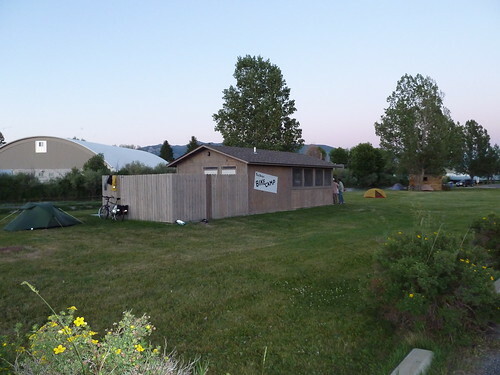 Twin Bridges is a small town that has realised that cyclists equal $$$; they have built a cyclists hut with picnic tables, maps, tools, hot showers, toilets and camping in a lovely riverside park next to the hut. All they ask for is a donation. Arriving at the hut I was glad to see that the Psycho Cycler wasn’t there, but two people who I had heard so much about and had been longing to meet were. Barb and Fred, an Australian couple from Melbourne crossing America on a tandem, nothing to strange in that you may think, but at the ripe old age of 77, this inspirational couple were a force to be reckoned with. Bright as buttons they could have easily been in their 30’s, with a wicked sense of humour they were great company and were without doubt the stars of my 2010 Trans Am. Fred had suffered a hernia half way across the states and was advised surgery would be required; as a hernia support wasn’t the comfiest of things to wear cycling and no time for surgery, he simply rolled up a cyclists lycra arm warmer and stuffed it down his shorts to hold the hernia in place! Most people would have probably given up after suffering such an injury, but Fred and Barb simply christened the hernia Tweety. They explained that the name came about as the extra “packaging” in Fred’s tight cycling shorts from the rolled up arm warmer reminded them of his tight fitting red Speedos he was renowned for back home, or “Budgie Smugglers” as the Ozzies like to call them, hence Tweety. They were already planning next years cycle tour from the Netherlands to Rome and when asked about other more menial travels, such as a cruise of the Caribbean, they simply turned the noses up and said “we’ll do that when we get old!”. I would be fortunate to spend numerous evenings chatting with Fred and Barb at various camp sites on the trans Am. The Biker hut at Twin Bridges was filling up fast. There was Frank on a recumbent who looked like Ben Folds and had a similar fetish as me for canned pineapple cubes and cottage cheese! Hank, an English teacher living 8 years in Korea and back on vacation; cycling with Eli from Indiana who had a strange accent, groovy “Dumb & Dumber” haircut and was to be our hero of the night. I headed out to dinner with these guys and decided to add some variety to my diet with pizza rather than a burger! Arriving back at the hut I noticed the J’s had turned up, having unsuccessfully tried to hitch hike with bikes up the notorious hill from Ennis. Then to my horror Psycho Cycler appeared, totally inebriated, to spoil our pleasant evening! He introduced himself to the J’s by making lecherous comments, laughing and announcing out loud “I just farted!”… how pleasant I thought! “Ah so use must all be sighcling on this Trans Am route (belch), we weren’t, but there was no point arguing with this moron. 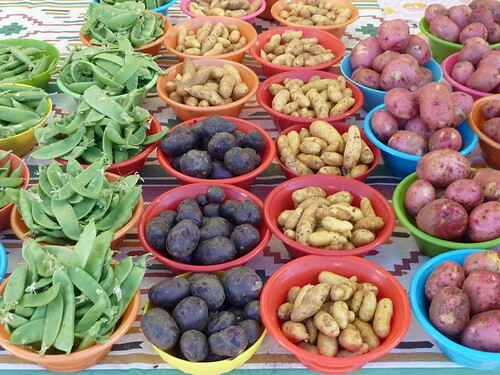 You don’t need maps… just go with the flow…(belch).. mix with the locals. I just been playing them at pool and drinking Tequila” here we go again I thought, what has this bloke got against ACA routes and following maps, maybe his inability to socialise with other cyclists on route could be a key factor as to why he cycles the back roads on his own! He then preceded to spout out more drunken diatribe about how he used to be a BMX champion, hill climbing expert and various other has-been brash statements. 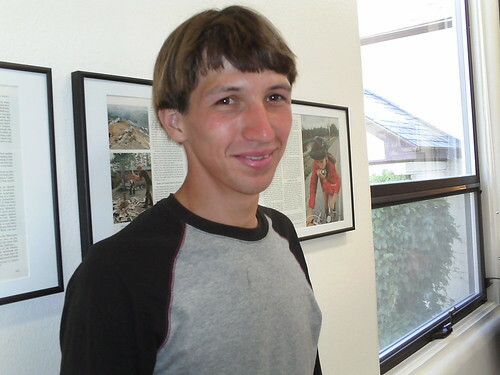 After stating he had got 45 miles per hour out of his bicycle, Eli innocently replied, “I got 52 out of mine”, oh s*it…. red rag and bull sprang to mind. “Well I’ll race yur then”, for a man that could hardly stand that was quite a ominous challenge. Eli politely refused, but after a bit of egging on he agreed and in the fading light Eli and a very wobbly Psycho Cycler headed out to the road by the park whilst we stood cheering and swatting mosquitoes. The mile sprint down the road and back was won effortlessly by Eli, much to our enjoyment, but of course Psycho Cycler had 101 excuses as to why he didn’t win. We also heard from the locals that he was dire at pool, hence having to drink a shot of tequila for every game he lost. That was the last I saw of Psycho Cycler, I’m sure he’s gone off down some side road in the wrong direction annoying the hell out of everyone he meets! I woke to take on another big day, 75 miles to Jackson MO with Badger Pass (6760’) and Big Hole Pass (7360’) to contend with. About 30 miles into the day I cycled under Interstate 15 to start the first ascent and was immediately hit with headwinds coming off the mountain, it was going to be a slow 14 mile climb! Half way up I looked back down the steep straight road to see Fred and Barb, a tiny slow moving dot in the distance. 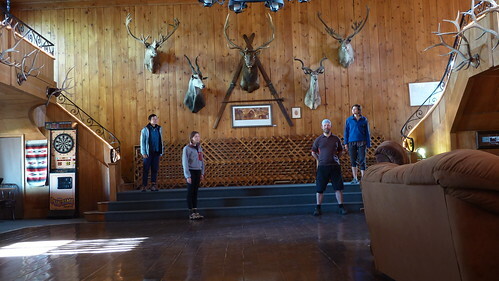 I got into Jackson (population 38) exhausted, followed much later by the J’s who had managed to hitch a lift with 3 bikes and all their gear in a pick up truck. I’m sure I wouldn’t have had the same hitching success as those three lycra clad lovelies! 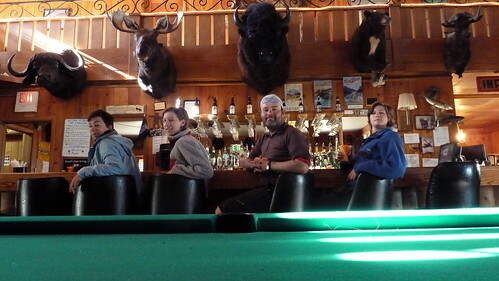 A soak in the Jackson Hot Springs Hotel’s thermal pool helped ease the aching muscles and a few beers and a great duke box, along with the J’s entertaining the locals, it ended up being a great evening. Fred and Barb didn’t appear in Jackson that night and with nothing but sage brush and mountains between the last place I saw them and Jackson itself, I was rather concerned as to were they where. I needn’t have worried, exhausted by fighting the head wind all day, they had camped beside a barn, using it as a wind break! 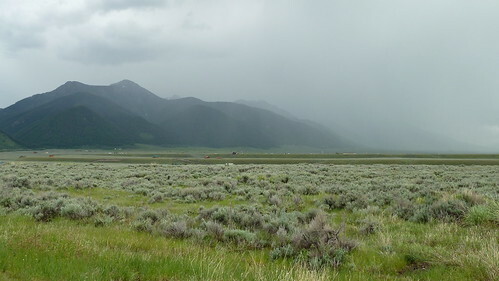 The next day started with an 18 mile ride along the beautiful Big Hole Valley, circled by mountains this wide valley dotted with loaves of hay made with ingenious Beaverslides was also known as the “Land of 10,000 haystacks” and is full of history. Enjoying my pre breakfast ride on this scenic, traffic free, straight as a die road, something unnerved me, I spotted a shadow racing along the road from behind, getting bigger and closer, the sun blocking my view of what was causing it. Something impacted my crash helmet and knocked my head to one side, I looked forward as a large Osprey climbed skywards to start it’s second attack run. There was no where to take cover and as I pedalled faster I could see chicks in a nest, on a tall pole next to the road, this Osprey was protecting it’s young. After three or four more attacks I managed to pedal out of it’s territory, but I was to go through another similar attack five miles up the road! This video catch’s the tale end of what happened, you can see the small birds attacking the Osprey. Scary stuff! The Chief Joseph Pass (7,241’) was my exit from the Big Hole valley; pine clad and long, the reward was a huge down hill into Sula and a well earned rest and evening of socialising at the camp site with Fred and Barb who arrived later and a few new cyclists heading east. You may recall Brian from a previous Blog post and his endless trans American quest for women, well on Big Hole pass I came across a cyclist with a similar raison d'être, but a far better way of carrying it out. Dean, recently divorced and trying to find a new woman in his life had come up with a devious plan. Signing up for online dating, he had filled out his profile but was changing his location every week or so to a location further along the Trans Am. This was giving him regular dates across the US and occasionally somewhere to stay for free! Far better than Brian’s plan of heading through the desert! 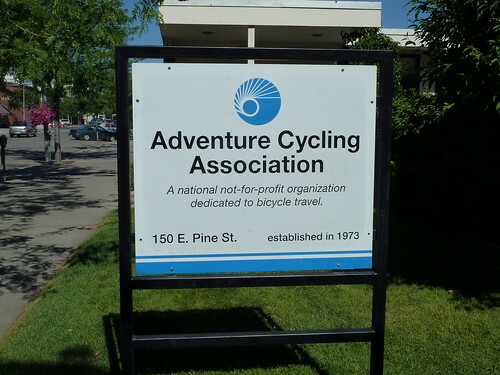 I was almost at the end of my journey through Montana, but decided to take a side trip out to Missoula, a cool University city and fabled home of the Adventure Cycling Association. I was also due for some rest days so I booked three nights in a Motel and took the biggest break of the trip. It was great to visit the ACA head quarters and say hello to some of the folks who I’d communicated route info with via Twitter over the previous months. 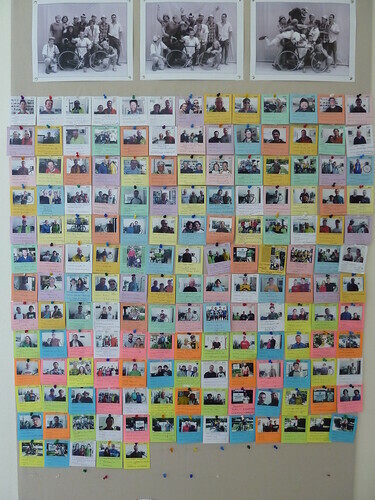 The HQ also has a wall of fame of all the 2010 riders that pass by the office, I’m proud to say I’m now on it! I also invested in some new tyres at the ACA shop and used my motel room as a work shop whilst fitting them, hopefully it would be the end of my puncture nightmares! 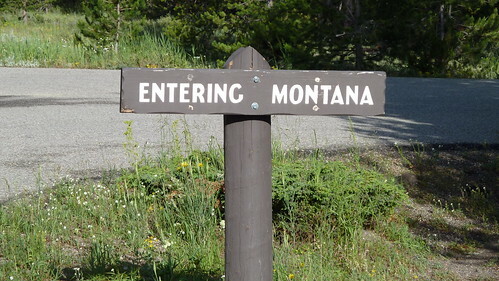 Missoula had great cafes, pubs, bike shops and a really nice feel about it. The farmers market was brimming with beautiful fruit and veg and I wandered around people watching and gorging on cherries. I even managed a visit to an REI store, America’s outdoor equipment cooperative, puts Millets to shame!! It seemed everyone was converging on Missoula, the J’s turned up, Fred and Barb and the ACA Trans Am group and I was also introduced to Klaas and Gosse, two Dutch guys that were to become good friends on the final leg of the journey. 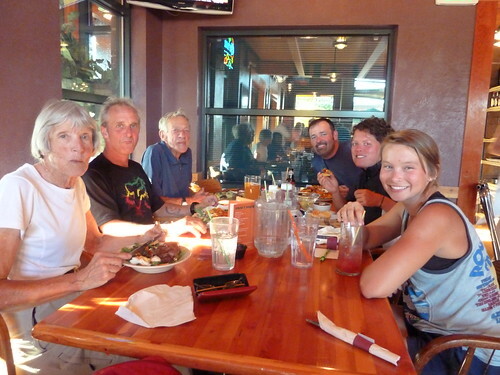 Some of us headed off to a local brew pub for a great meal and in no time the two days had gone and I was back on the road. Awesome account of events and fabulous photos! Thanks for reading lis. Yes he was quite a bizarre character and I hope I don't bump into him going down the Pacific Coast! I did this route with my 22 yr old son earlier this summer. Your blog brings back fantastic memories. Enjoyable read with my birthday morning coffee. 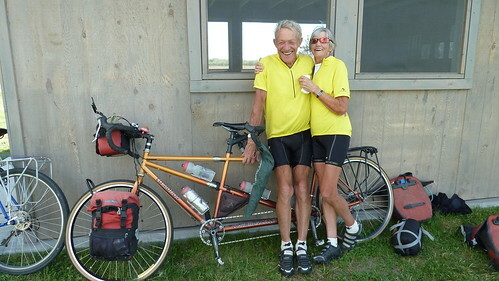 Older tandem couple gives this 71 year old motivation to get those touring plans moving! Thanks Ken. It brought back some good memories of my own TransAm. That climb out of Ennis really was a pig. I was wobbling up it past a huge motor coach coming the other way when a second huge motor coach decided to overtake the first one. I was seriously considering diving into the ditch. They were still building the facilities at Twin Bridges when I passed through. The man doing the work said that "You cyclists are such darn nice people". Did you meet the guy in Virginia City with a beard halfway down his chest who claimed to have been an extra in a couple of well known movies?